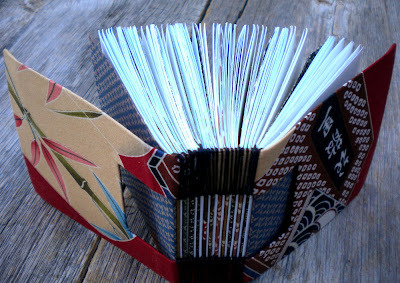 The first swap book that we will look at more closely is this one from Anna, of PurpleBeanBindery. She said that when she made this book, she was trying to design a journal that would not be intimidating to write in. This chunky journal with the button-hole binding was the result. 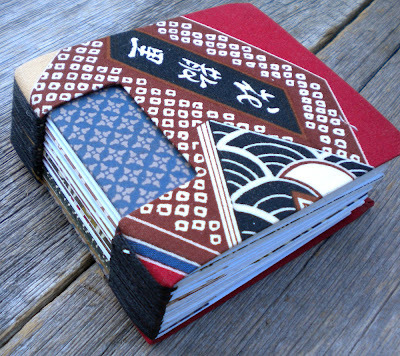 It has a page for every day with monthly dividers made from a variety of decorative papers. Visit PurpleBeanBindery.Etsy.com to see more of Anna's books. It looks great! I love the various colors, and how bulky it looks. What a fun journal! And a great way to use up all those paper trimmings lying around! Thanks for the feature and lovely comments. It was a fun book to make. And as the year comes to an end I need to make another for myself!